Filmed using a 360 degree camera, during the video you may click on the arrows to move the camera angle to view the rooms. The lavender color was specifically chosen to bring Love, be Welcoming and Calming. We diffuse a relaxing blend of Essential Oils and have matching Harp Enrichment Therapy music playing. Along with our Fear-Free techniques, we hope your pet and you get a “Spaw”-like feeling when you enter our front doors. 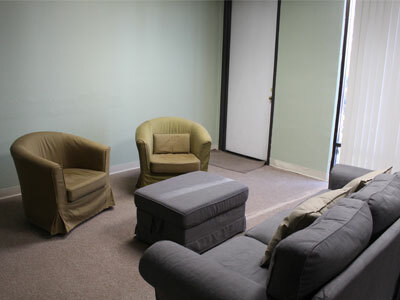 This room is painted blue to represent Intuition, Communication, and Creative Expression. 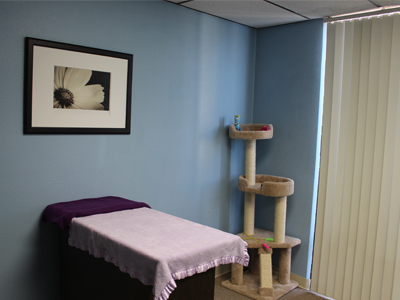 Our exam table is non-slip and covered with a soft fleece blanket sprayed with kitty pheromones to help your cat feel calm and comfortable. The cat tree is available if Kitty prefers to perch. Painted green with a little yellow mixed in for Vitality, this room is known as Fido’s Fort. It’s color was chosen to promote Compassion, Healing, and Centering. Set up like a living room, we are not at all like a traditional clinic. Most examinations are done on the floor and if the examination table is needed, no stainless steel is in sight. The table is covered with a non-slip surface and a fleece sprayed with “Mommy-dog smell,” which should help your fur baby feel right at home. This particular room is also set up like a living room. No exam table is present because all treatments are performed on the floor, the sofa, or on mom’s or dad’s lap. 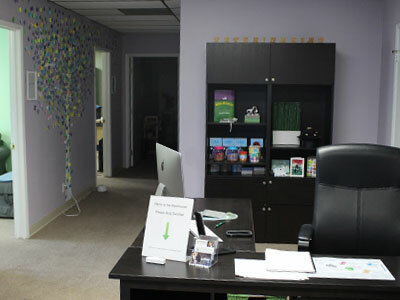 Like Fido’s Fort, the green color promotes Compassion, Healing, and Centering with a calm feeling. This room is also sprayed with “Mommy-dog smell” to bring a sense of well being and belonging.